26th May, Busan: Second-seed, Annop Arromsaranon of Thailand bagged his first international PBA title at the concluding 2018 PBA-WBT Busan Cup International Bowling Tournament with victory over topseed, Anthony Simonsen of Austin, Texas, 221-208 in the title match. Arromsaranon started with a strike in his opening frame as Simonsen downed a double. The Thai responded with a strike in the second and converted a 9-pin spare in the third frame. The American PBA pro stumbled to a 7-pin split which he failed to convert to trail his challenger. Although Simonsen recovered with a strike in the fourth frame, Arromsaranon struck twice in his next two frames. The soaring heat at the outdoor lanes at Suyong Bay must have played tricks on the lane as Simonsen encountered another 8-pin split in the fifth frame. With confidence rising, the Thai struck twice again in the fifth and sixth frames to open up a big gap. Despite responding with a double in the sixth and seventh frames, the two-handed American was playing catch up and was trailing by as much as 44 pins. It did not mattered much to the tie when Arromsaranon had a big 6-pin split in the eighth frame as his opponent could not stike in the eighth frame. Although Simonsen did bring home three consecutive strikes thereafter, Arromsaranon's strike in the ninth frame more or less decided the match. 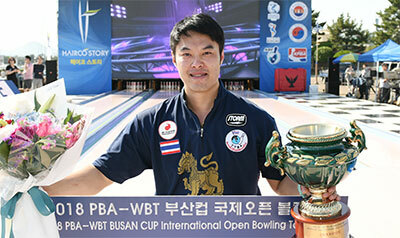 Arromsaranon became the second Thai to win a PBA title following his compatriot, Yannaphon Larpapharat, who was the first when he won the 2017 PBA-WBT World Bowling Tour Thailand. The champion, who picked up the top prize of 30 million Korean won (approx. US$27,800) and awarded a PBA title as a member of the PBA, had earlier edged winner of the first match and third-seed, Choi Seokbyeong of Daegu City, Korea 215-203 to advance to the title match. 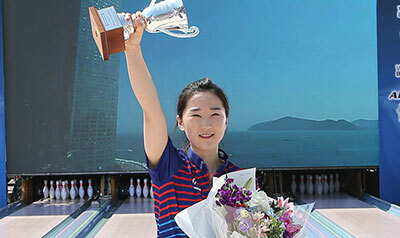 Choi, who defeated fellow-countrymen and KPBA's Choi Wonyoung, 247-217 in the opening match, earned 8 million won. Wonyoung took home 5 million while the first runner-up, Simonsen pocketed 15 million won. Meanwhile, Korean National Team member, Jeon Eunhee defeated topseed and KPBA's Park Jinhee, 212-184 to win the Women Division crown. Jeon picked up 8 million won while Park settled for 4 million. The stepladder TV finals started off with the General division in which topseed, Jeong Jaehun of Degu City eaily defeated fellow-citymen, Seo Hyeonjin, 247-214 to win the title. Jeong picked up 5 million won for his effort while Seo earned 2.5 million won. KPBA President, Mr Kim Eonsik, World Bowling Vice President, Ms Suwalai Satrulee and Vice President of Busan Metropolitan City Council were on hand to present the top prize and trophy to the champion. The first of two PBA-World Bowling Tour stop in Asia this year, the 2018 PBA-WBT Busan Cup is organized by the Korean Professional Bowling Association in conjunction with Busan Metroplitan Bowling Association. The prestigious tournament is endorsed and sanctioned by Korean Bowling Association, Asian Bowling Federation and World Bowling. The field of 220 finalists from over 18 countries and divided into four shifts, contested the two blocks of 5 games each over two days. The top 11 from each squad advanced to the semi-final round for another 6 games. The top 4 finishers proceeded to the Stepladder TV finals.